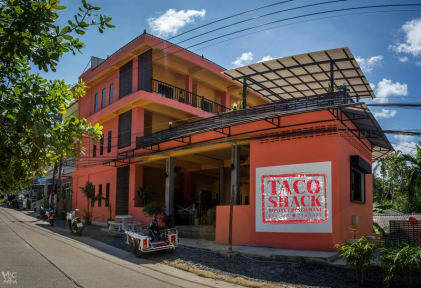 Taco Shack Hostel (Sairee Beach) was built with the traveler in mind. It is located in Sairee Beach, which is famous for it relaxing beach by day and electrifying nightlife. There are plenty of shops and restaurants close by to please any shopaholic, very easy to walk around from place to place. This property has 6-8 beds mixed aircon dorm rooms with en suite bathroom for your convenience. Each room offers large comfortable mattress, your own power outlets and nightlight. There is fast free Wi-Fi throughout the building, hot showers, and metal lockers for your safety. The rooms have a balcony to relax on with fantastic sea view. Breathtaking sunset view, 2 garden terraces and a huge rooftop for chilling out while watching the sunset - also used for movie nights. The restaurant serves great Mexican food with an island twist for those travellers who are a bit bored of rice and noodles. Every evening we set up games and activities for guests to make new friends and socialize with cheap beers, cocktails, and of course, buckets. - We reserve the right to cancel any reservation after 19:00, please email us if you are running late. 2. Check-out Time: until 11 am. (1) Half day fine for late checks out during 12: - 16:00. (2) 1 day fine for late check out after 16:00. 3. Payment: Cash, credit card or Paypal is welcomed upon arrival. 5. Age Restriction: The minimum age to check in is above 17 years old, no children.